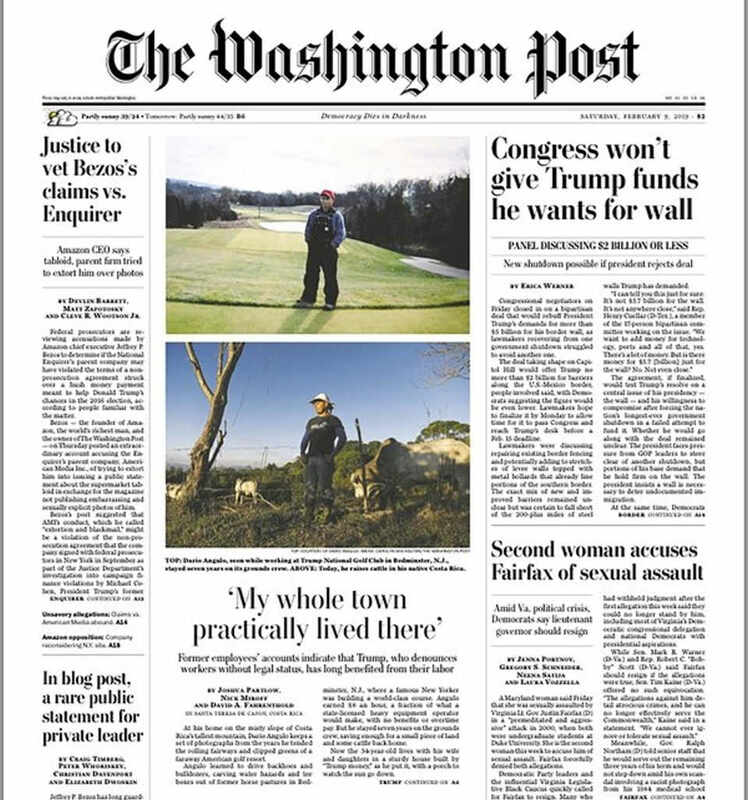 On Friday, the Washington Post published a damning report of the full scope of how the Trump National Golf Club in Bedminster, New Jersey went out of its way to employ undocumented immigrants for years, many of whom were from the town of Santa Teresa de Cajon, Costa Rica. “Many of us helped him get where he is today. 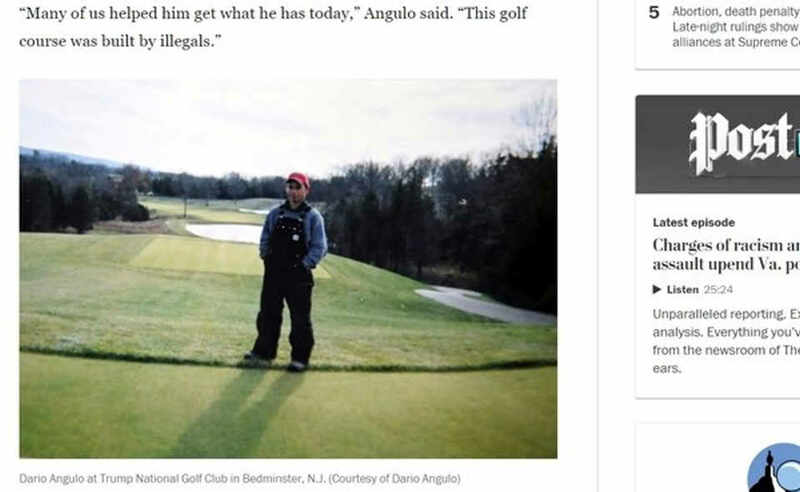 The golf course was built by illegals,” says Darío Angulo; one of the Costa Ricans interviewed by the Washington Post. 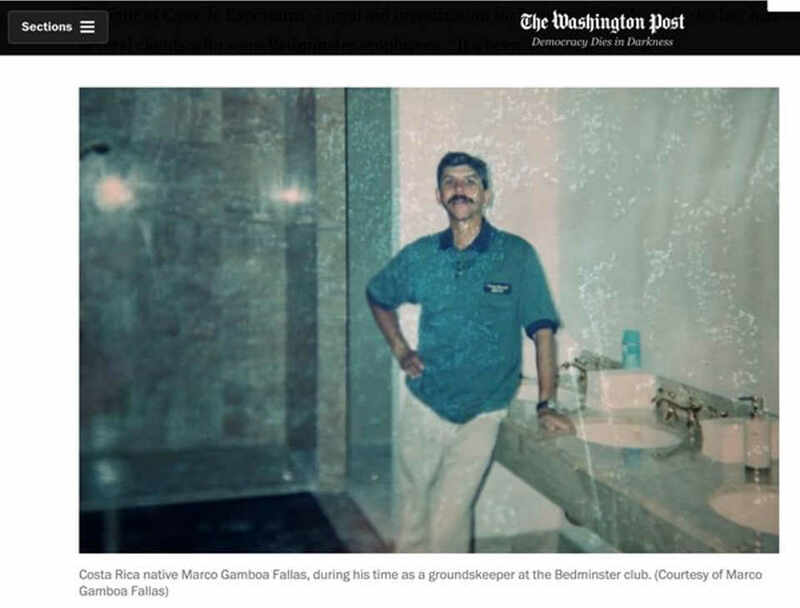 The Post says it interviews 16 Costa Ricans (men and women) and people from other countries (El Salvador, Guatemala and Mexico) who confirmed having worked illegally at the Trump golf club. All had a similar story, that their superiors knew of their illegal immigration status in the United States. Among the former workers who still reside in New Jersey, contributed work stubs and photos to confirm their time at the golf club. They even identified relatives and friends who also worked there. Many of the Tico workers with the Trump organization are from Pérez Zeledón, south of San Jose. 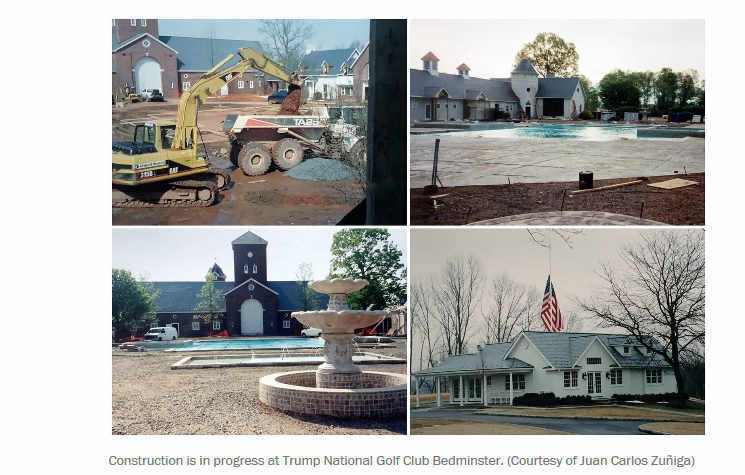 “Soon after Trump broke ground at Bedminster in 2002 with a golden shovel, this village emerged as a wellspring of low-paid labor for the private club, which charges tens of thousands of dollars to join. Over the years, dozens of workers from Costa Rica went north to fill jobs as groundskeepers, housekeepers and dishwashers at Bedminster, former employees said. 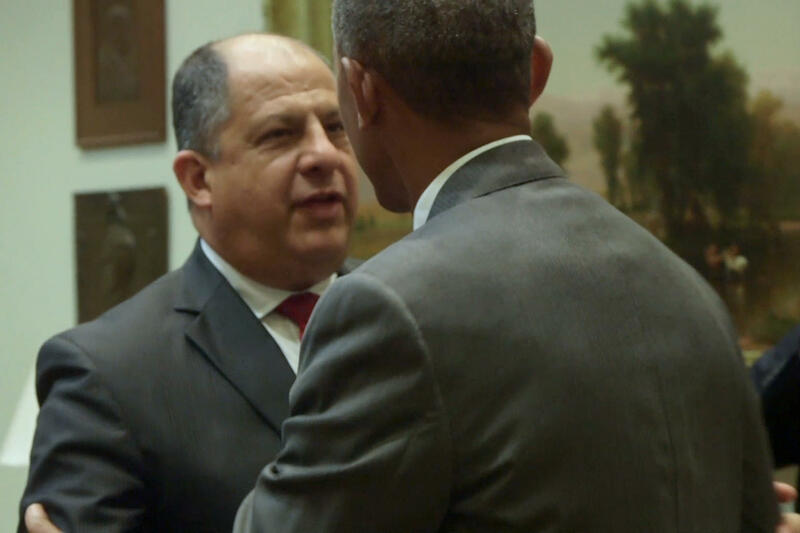 The club hired others from El Salvador, Mexico and Guatemala who spoke to The Post. Many ended up in the blue-collar borough of Bound Brook, N.J., piling into vans before dawn to head to the course each morning. 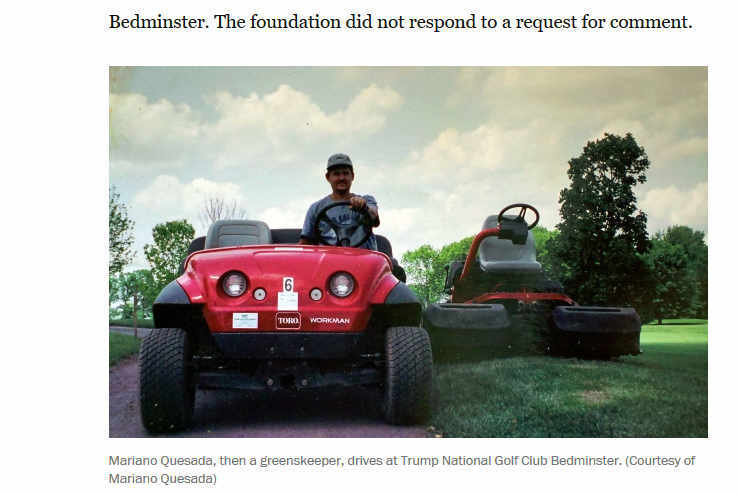 “Their descriptions of Bedminster’s long reliance on illegal workers are bolstered by a newly obtained police report showing that the club’s head of security was told in 2011 about an employee suspected of using false identification papers — the first known documentation of a warning to the Trump Organization about the legal status of a worker. That would be the first known documentation of a warning to the Trump organization about the legal status of a worker,” the Post reports. This is not a good look for President Donald Trump, who has made cutting immigration — even legal immigration — a top priority and shut down the government for the longest period in its history over a border wall to keep the “brown menace” out. In fairness, many businesses in the U.S. like using undocumented – illegal – labor because it is cheaper, legal rights are few, and managers can keep employees in check by using threats to turn over to immigration. Over the years, Costa Rica’s connection to Bedminster expanded as workers recruited friends and family. Some, the Post report reveals, traveled to the United States with tourist visas and others paid the smugglers thousands of dollars to help them cross the border between the United States and Mexico, former employees commented. The new employees said they needed little more than a false residence card and a fake Social Security number to get a job. One of the Costa Ricans cited by the Post is Juan Carlos Zúñiga who left Santa Teresa, in Cajón de Pérez Zeledón, to make the trip to the United States in 2002. On the border between the United States and Mexico, he claimed to have climbed a three-meter fence to jump into Nogales County in Arizona. The Tico bought his first fake documents in Las Vegas where he adopted the name “Juan Lara”. Then he took a flight to New Jersey. Some of the first Costa Ricans hired to build the golf club (Zúñiga, Darío Angulo and his neighbor of Santa Teresa, Abel Mora, among others) assured that it was punishing work. 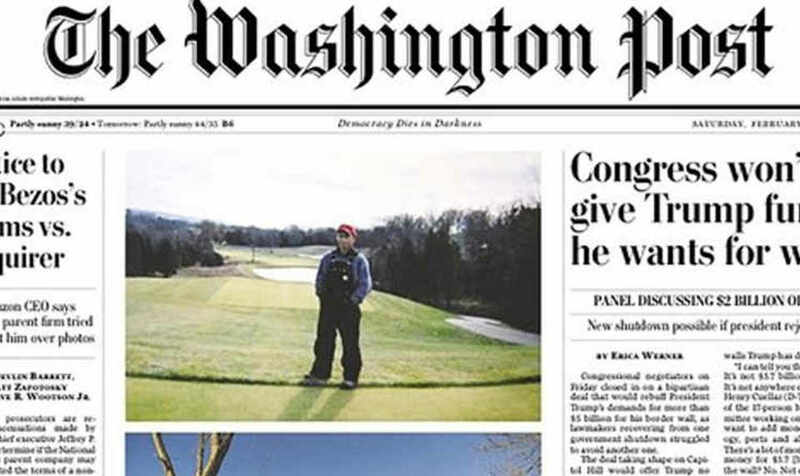 According to their stories to the Post, they worked from dawn to dusk, up to seven days a week, dragging and raking mountains of earth removed with heavy machinery and then transforming it into fields for golf holes. “It was rake, a rake, a rake, all day,” said Zuñiga. Other tasks were planting, watering, mowing, building sand traps and driving excavators, mini excavators and loaders, all while earning around US$10 per hour or less. Around that time, a heavy equipment operator licensed in downtown New Jersey would have received on average five times or more ($51 to $55 per hour) in wages and benefits, according to union officials from the International Union of Operating Engineers Local 825 in the nearby town of Springfield. As the golf course took shape, more hands were needed. The bosses informed Zuñiga and his friends to bring workers. The town of Santa Teresa responded. 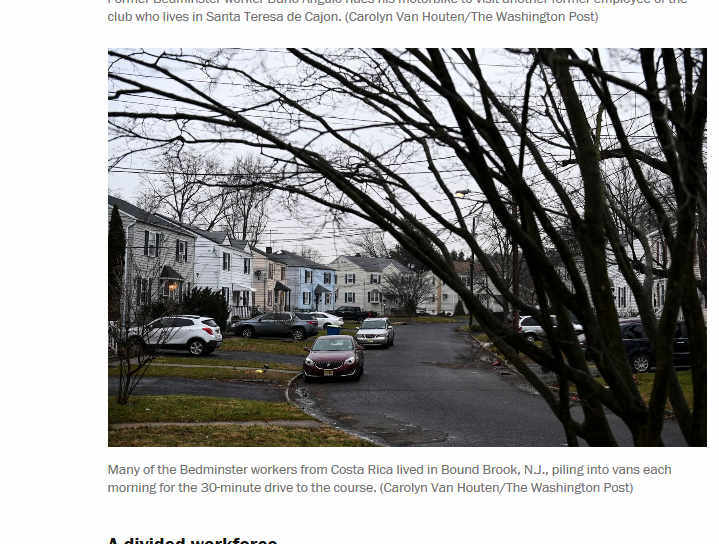 Mariano Quesada, who rented an apartment in the Bound Brook area to several Costa Ricans, told the Post, hi wife, Angela, got up before dawn to prepare breakfasts and lunches for up to 22 people who were then working at Bedminster. The workers came not only from Santa Teresa de Cajón, but also from other parts of Costa Rica and Latin America. In a short time, we read in the text, up to 100 Ticos were working there, to the point that Zúñiga’s cousin began charging workers for trips to Bedminster. “All my town practically lived there,” according to Quesada. “For those growing up here, as elsewhere in Central America, the risky trip north to the United States can mean seed money for a decent life,” says the Post. To get a job there, Costa Ricans, as well as other Latinas who worked at the club, acquired fake US green cards and fake Social Security numbers in Bound Brook and neighboring cities, that were easy to get. Sandra Díaz, from Poás de Aserrí, even keeps photographs at the Walgreens where she paid a friend of her $50 for the false documents. Before going to her interview, Vásquez asked a friend if the club would hire people with false documents. “I thought: ‘This is a place with a very famous owner,'” she recalled. 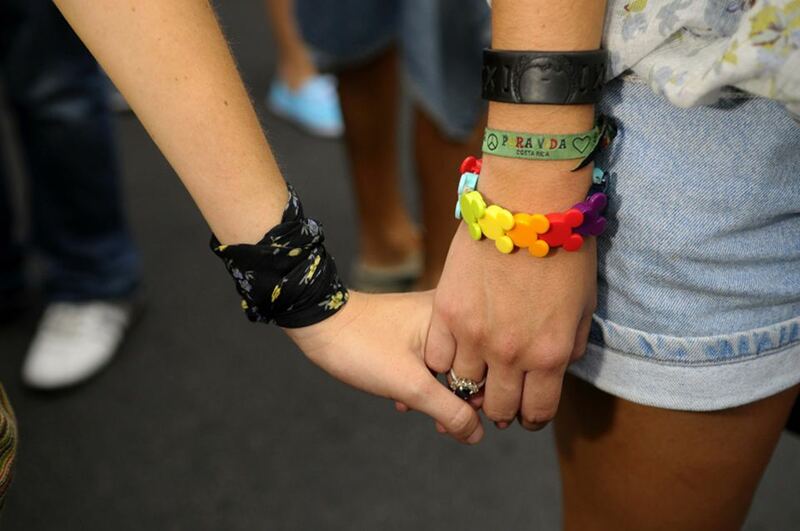 “My friend said there was nothing to worry about”, she said,” They do not care,” according to the Washington Post report.